Acerola (also known as Acerola cherry and Barbados cherry) is a nutritious fruit of plant botanically known as Malpighia Emarginata. It is known to possess strong medicinal properties that are mainly attributed to its rich nutritional content, mainly Vitamin C content. It is rich in vitamin A, vitamin C, and vitamins B1, B2, and B3. It also offers a rich source of bioflavonoids and carotenoids, which provide a high nutritive value and antioxidants for the body. Malpighia Emarginata is regarded as an effective herb that can help in the prevention and treatment of several disorders. Acerola contains ascorbic acid (Vitamin C), which varies from 1 gram to 4.5 g per 100 grams of acerola cherry. Malpighia Emarginata is a tropical shrub or a small tree that belongs to the family, Malpighiaceae. This fruit-bearing plant is a native to the South America and southern Mexico. The common names for this shrub include Acerola (Spanish pronunciation), West Indian cherry, Barbados cherry and wild crepe myrtle. Malpighia Emarginata is a large, bushy shrub having branches that are either erect or drooping and spreading. It is a popular bonsai plant with small leaves, fruits, and fine ramifications. The plant appears minutely hairy and has a short trunk that is about 10 cm in diameter. The fruit of the plant is edible and consumed widely in the native area of the species. It is cultivated in other parts of the world for its rich vitamin C content. A 100 gm of the fruit provides about 1677.6 mg of the vitamin C. The fruit is commonly used to make pulps, juices, and vitamin C concentrate. It is also a common ingredient in several baby foods. Acerola is also grown for the ornamental purposes. Emarginata is often a host plant for the caterpillars like Chiomaraasychis (white-patched skipper) and Ephyriadesbrunneus (Florida dusky wing). The larvae of the Anthonomusmacromalus (acerola weevil) feed on the fruits of the plant while the adults consume its young leaves. Emarginata is originally from the Yucatán, but can also be found in the Mexico, the Caribbean, Central America and the South America. This plant is also grown in the southern parts including Peru, and the southeast regions of Brazil. It can be found in the Lower Rio Grande Valley of Texas and the southernmost parts of the United States. In Florida, Acerola is grown in protected locations. It is also cultivated in the tropical and subtropical regions including Ghana, Ethiopia, Canary Islands, Madagascar, Sri Lanka, Zanzibar, Taiwan, Hawaii, India, Java, and Australia. Acerola is a native of West Indies. It has become naturalized in Jamaica, Cuba, and Puerto Rico and is commonly grown in the dooryards in the Bermuda and Bahamas, and to some extent, in the South and Central America. Malpighia Emarginata is a small tree that can grow as tall as 6.09 m or 20 feet. Malpighia Emarginata can be propagated using different methods including the seeds and cutting. The germination is usually low. It grows well in dry and sandy soil and under full sun. It also prefers a warm to hot climates and a slightly acidic soil. However, it cannot endure the temperatures lower than 30°F. It can sustain in long periods of drought. Since the roots of this plant are too shallow, it has a very low tolerance to strong winds. The trees often require little or no care. B-17: It is a common variety that is very high in vitamin C and other essential nutrients. Dwarf: It is a low-growing cultivar that can attain a height of about 2 feet. It can grow well even in a hanging basket and can survive in much colder weather than the others. Florida Sweet: It is a common California variety. The fruits are large, about 1 inch in diameter. The skin of the fruit is thick and the flesh is juicy. The flavor is apple-like and semi-sweet. The vitamin C content of this variety is about 1,500-2,000 mg per 100 grams. Manoa Sweet: It is orange or reddish fruit that is sweeter to taste than the others. The tree is upright, spreading and very productive. There are several other varieties of this plant including Beaumont, Maunawili, Haley, Red Jumbo, Rehnborg, Hawaiian Queen and Tropical Ruby. The flowers are sessile and borne on the short-peduncled cymes. It has 5 sepals that are pink or lavender in color. The flowers are bisexual. The sepals are fringed and spoon-shaped. They are pale to deep red and pink. Around 10 stamens and 6 to 10 glands can be found on the calyx. There are about 3-5 flowers per inflorescence, which are short-peduncled axillary cymes. The tree produces bright red drupes after three years that are 1 to 3 cm in diameter with a mass of approximately 3 to 5 grams. The drupes are in groups of three or pairs. The fruits are round or oblate and cherry-like with 3 lobes. They are bright red or sometimes yellow-orange in color with a thin skin that is easily bruised. The pulp is very juicy and acidic to sub-acidic in nature. It is nearly sweet and has a delicate flavor. The leaves are ovate-lanceolate, about 2 to 8 cm long and 1 to 4 cm in breadth. They are attached to the short petioles and have an undulating or entire margin with small hairs that can irritate the skin. The fruit of Acerola is edible and consumed for its medicinal and nutritional value apart from its culinary use. It is commonly used for the treatment of allergic rhinitis and herpes. It is used in parts of South America to flavor drinks, ice creams, and cocktails. The fruit is a part of numerous commercially-available nutritional and vitamin products, mainly for its vitamin C content. Acerola juice is as popular and commonly used in the Brazil as the orange juice is in the North America. A handful of the fresh fruit is consumed as a natural remedy for treating fever and dysentery. In Brazil, it is used as an anti-inflammatory agent, stimulant for the renal system and the liver, astringent and a diuretic. It is used by the natives to heal wounds. It is recommended for the patients suffering from cardiac ailments to support the heart functions. It works well as a nutritive aid for managing anemia, tuberculosis, high cholesterol levels, diabetes, rheumatism, and during convalescence. The Acerola fruits of the plant are mainly used for extracting its high nutritional content and used for therapeutic benefits. Acerola provides a rich source of vitamin C, about 1000 to 4000 mg per 100 grams. The green, unripe fruits contain twice the amount of Vitamin C than the ripe fruits. The high amount of Vitamin C in Acerola helps improve the immunity of a person. It helps in the prevention of infections and also allows a person to recover faster from any illness. Vitamin C prevents the formation of blood clots thereby preventing stroke, heart attack and peripheral vascular diseases. It regenerates the damaged skin tissues and builds collagen, which helps in maintaining the youthfulness of the skin and prevents wrinkles, fine lines, and stretch marks. Acerola fruit is used traditionally for the treatment of scurvy, a condition caused by the vitamin C deficiency. 100 grams acerola contains about 1677.6 mg Vitamin C content in natural form, which is highly absorbable in the body. Taking 100 grams Acerola cherry daily for a week is effective for curing scurvy. All symptoms of scurvy are completely cured within seven days with acerola. It enhances the production of insulin in the pancreas and helps maintain the glucose levels in the blood. The regulation of insulin production and glucose uptake are the crucial means for preventing the sudden spikes and drops in the blood sugar levels in the diabetic patients that can lead to life-threatening consequences. A regular use of Acerola can also help prevent the onset of diabetes and regulate the levels of blood sugar in the individuals who are prone to develop the condition due to the presence of high-risk factors like family history and obesity. Acerola contains a mix of antioxidants, such as bioflavonoids and carotenoids, which neutralize the damaging effect of free radicals on the vital organs and tissues. Free radicals are the byproducts of the normal cellular metabolism, which can cause the healthy cells to mutate into unhealthy or cancerous cells. Acerola has been found to reduce the risk of lung cancer and also hasten the recovery of the patients suffering from the same. It helps to slow down the growth of the cancer mass and prevents its spread. The high amount of antioxidants in the Acerola fruits make it an effective natural remedy for cleansing the body. It helps in eliminating the dangerous toxic substances from the body and purifies the blood. 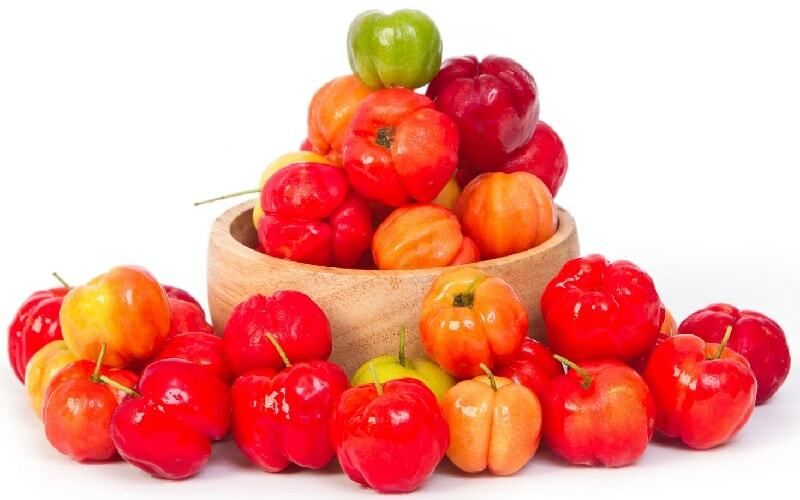 The carotenoids in Acerola protect the eye health and prevent the age-related vision disorders. It preserves the youthful glow of the skin and allows it to appear young and vibrant. The bioflavonoids in this fruit boost the cognitive functions of the brain, which help to prevent the onset of age-related diseases like dementia and Alzheimer’s disease. Acerola offers an effective natural solution for the people who want a quick boost for their immune system. A regular consumption of this fruit strengthens the immunity and provides relief from the symptoms of allergic disorders. The use of Acerola is recommended for the people suffering from asthma, allergic rhinitis, and allergic dermatitis. It helps in reducing the frequency and the intensity of the attacks of these disorders by modifying the response of the immune system to the allergens. It stimulates the production of white blood cells, which act as the body’s first line of defense against the foreign bodies and pathogens. It allows a faster cell repair in case of damage and injuries by strengthening the response of the immune system. Acerola helps in regulating the different metabolic processes in the body with its vitamin B content. These vitamins, including riboflavin, niacin, and folic acid, help to regulate the metabolic and hormonal processes to ensure an optimum functioning of the body’s organs. Acerola is a rich source of potassium just like the other juicy fruits. Potassium is an essential nutrient required for carrying out the functions of the heart. It can boost the heart health by protecting the cardiac tissues from the damage caused by the free radicals. Potassium also acts as a vasodilator and ensures an uninterrupted supply of blood to the cardiac tissues. It relieves the strain on the circulatory system by dilating the arteries and increasing the blood flow. It is also a very good remedy for treating hypertension. The vasodilatory property of Acerola helps maintain the blood pressure within normal limits. It can also lower the chances of developing atherosclerosis, and thus, reduce the risk of heart attacks and stroke. Acerola also contains a good amount of fiber, which has a significant value in maintaining the functions of the digestive tract. It promotes a smooth passage of food through the digestive tract and relieves the disturbing symptoms like constipation, diarrhea, bloating, cramping, and gastric ulcers. Fresh Ripe Acerola 50 to 100 grams fresh ripe acerola cherries can be taken twice or thrice a week. Note: You should not start Acerola in high dosage. If you are going to use acerola first time, then you should take less than 25 grams. Acerola Powder should be started with dosage of 1 gram per day, and then its dosage should be gradually increased to 2 to 4 grams. Acerola (Barbados cherry) is considerably safe when used occasionally. 100 grams acerola cherries can be taken twice or thrice a week. Acerola may cause an allergic reaction in some sensitized individuals. People with a history of allergy to this fruit should avoid consuming it. Acerola products (especially acerola powder, extract and juice) are best to avoid during pregnancy and lactation, as no safety information is yet available. Gout (Elevated Uric Acid): The high levels of vitamin C in Acerola can be counterproductive for the patients suffering from gout as it can boost the levels of uric acid and worsen the gout symptoms. Kidney stones (nephrolithiasis): High content of Vitamin C in acerola might cause stone formation in the kidneys.